Now that I am 35 years old, I no longer reap the rewards graciously granted to me in my youth. Many moons ago, my waistline would easily forgive me whenever I had devoured a chocolate bar in one breath. My pre-pregnancy cardiovascular state was never an issue. And grey hairs and wrinkles were never a concern. Today, I am out of shape. I desperately need to update my wardrobe with clothes that actually fit. And I'm tempted now more than ever to yank out those less-than-subtle silver hairs that keep begging for attention. But wrinkles? Do I really have... wrinkles? Among those factors that affect your skin the older you get are: hydration, wrinkles, firmness, density, radiance, regeneration, dark circles and under eye bag. Until recently, my main concern has always been hydration and finding the right moisturizer. I have always had dark circles under my eyes, so that is something I became accustomed to very early on. But not wrinkles. I cannot possibly be battling wrinkles at the not-so-ripe age of 35. Or maybe I am. It is a well-known fact that wrinkles can be caused by age as well as ultra-violet light during sun exposure. I have also read that poor nutrition and lack of sleep can be contributing factors. (Is there a flashing neon sign pointing in my direction?) This is why I agreed to test the new Anti-Age Global line by Yves Rocher. Launched in February of this year, the Anti-Age Global line "boasts a World 1st in Botanical Beauty: the 4th generation of Plant Source Cells extracted from Echinacea." In the Botanical Garden in La Gacily, Botanical Beauty researchers set out on a quest to produce Plant Source Cells of remarkable quality and effectiveness. This led them to Echinacea Augustfolia. Plants have the power to regenerate themselves indefinitely with the help of extraordinary cells: Plant Source Cells. Researchers at the Yves Rocher Botanical Beauty Laboratories have proven the incredible potential of these Plants Source Cells on the skin. Incorporated in their entirety in unprecedented formulas, our 4th Generation Plant Source Cells from Echinacea work on the major signs of aging. These cells are called 4th Generation because they come from a unique elicitation process and are then incorporated in their entirety in the formulas. Through this patented process, their cellular structure is preserved and their maximum effectiveness is ensured. As a result, more than 100,000 Plant Source Cells are concentrated in each Anti-Age Global skin care product. After one week of using Anti Age Global, I have indeed seen a marked difference in the hydration of my skin. It feels noticeably smoother and the wrinkles on my forehead seem less prominent. Both the day and night creams were easy to apply evenly and did not feel overly greasy. Each of them had a slightly perfume-like scent that was pleasant. And a little went a long way. The eye care cream has a unique tip applicator that soothes puffy eyes and makes it easy to apply just the right amount. This did not seem to have any scent whatsoever. I would apply this every night before bed and will continue to use it in the hopes of improved the dark circles around my eyes. Previously, I had never really given much thought to applying moisturizer to the eye area but I was so pleased with the day and night creams that I am curious to see what the eye cream can do after a full month of use. 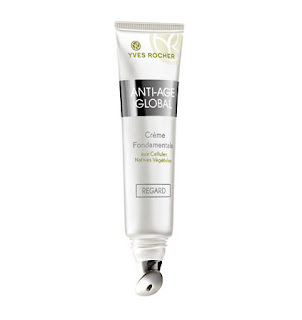 Would I recommend the Anti-Age Global line by Yves Rocher? If you're in your 30's, I think this line would be great as one-month cure to help reduce the signs of old age fatigue and to give you a boost of radiance. It would also be great as protection against the ravages of Canadian weather. I don't foresee using this line on a daily basis after the first month of using it but I will most definitely reserve it for those times when there are noticeable signs of fatigue and dryness. Anti-Age Global products range in price from $46 to $64 but are currently on sale at yvesrocher.ca for $25-$35. Plus, enjoy free shipping on orders over $40. 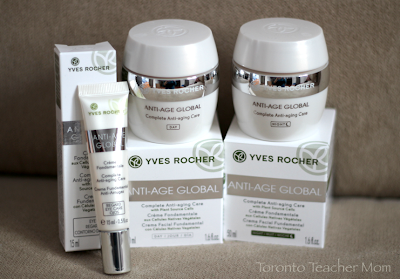 Or you can simply share your experience with anti-aging products here on Toronto Teacher Mom for a chance to win the entire line (ARV $170)! Simply leave a comment on this post sharing your thoughts on anti-aging products and reasons why you tried or want to try them. Then complete the GiveawayTools form below. Disclosure: I was sent product to help facilitate this review. Any opinions expressed in this post are my own. Honestly, I have mixed feelings about anti aging products! A part of me wants and does believe some claims but another part of me thinks that some claims are just not believable! lol It doesn't stop me from trying many products though! I know what you mean. People can make certain claims but everyone's experience can be different and/or vary widely. And I personally don't like to rely on products all the time. I think the Anti-Age Global is nice to have on hand to use off and on for a few weeks. Anything that will help me look younger without surgery I'm willing to try! I would love to try these anti-aging products because I think it would be easier to prevent than to erase wrinkles etc. I have heard great stuff about Yves Rocher. A part of want to think that anti-aging products works, but another part of me is thinking 'how much does it really work' and if it is worth the money for it. I've tried a lot of anti-aging products from various lines. I like to think they help, but do they really? I think we must factor in genetics and lifestyle. Thanks for the chance to win the products from Yves Rocher. I think Anti-aging products work only need to be in a whole bunch of good lifestyle habits. I'd love to try these products as I'm at the age where I need to start using anti-aging products. I see fine lines developing around my eyes and I'd like to start treating them now before they get worse. I'm getting older and want to look good, i'm all for these products! i think using products are much cheaper and definitely less painful than getting an injection in the face which is a definite plus! I would like to try them, as I am now in what I call old age my skin is dry and has no shine. I am getting to old and would love to try these, I have tried Olay anti aging and found it pretty good but I think these look like a miracle worker! I'm getting older and I'd love to try some of these products to see if they really work! I am often skeptical about them. I sometimes think that companies market them that way as a gimmick. I know this isn't always the case. I would like to try this product to see if it is real or a gimmick. I think anti-aging products are good as long as you go with a trusted brand. I'd love to try the Yves Rocher products as I've never used that brand before. I love trying new anti-aging products! Honestly I have tried some that have done NOTHING at all and others that are fantastic!! I have yet to try Yves Rocher anti-aging line! Im getting fine lines around my eyes. Stressful year; I need a little help to make me look younger and stress free! Love Yves Rocher - great line. I use moisterizer every day. I'd love to try these. Yves Rocher products are top notch, and at this point in my life I prefer to use natural products to help prolong a youthful look, not willing to opt for botox or surgery. Would love to try these Yves Rocher anti-age Global products....especially for the extra hydration around my chin and cheeks....seems that winter wreaks havock on this area for me. I like trying new products to see how effective they are! I'd like to find a product that works on my fine lines and dark circles. I have tried numerous beauty products and an always trying out new brands. I would love to try this line. With baby #2 and sleep deprivation on the way I need all the help I can get. I will be 38 on my next birthday and I'm definitely seeing a change in my skin. I havent tried that many anti-aging products,,but as I will soon be 35 myself,it is time to start taking care of my skin and prevent any more wrinkles from coming on. I would love to try this,thanks! Sometimes I think they all work the same as a regular moisturizer as I haven't had anything work on my fine lines, spots, or circles yet. I want to try them to see if it works on my problem areas, especially the dark circles and lines. I am just now starting to worry about the signs of aging, so the yves rocher products would be my first exploration. I think that they are great products, that can help us age gracefully! I would love to win these anti aging products as i am in my thirties now and am starting to see my skin aging more and more! I am a devoted user of anti-aging products and use them to minimize the look of wrinkles. I do tend to use anti-aging products but my skin is very sensitive and I don't like my facial products to contain scents. This is why I would try the eye cream since you mentioned that it didn't seem to have a scent at all. I'm not sure anti-aging products work any better than regular products but I am always willing to try new things out because you never know! I am only 28, but I want to start using them. I think its easier to prevent than it is to treat! I'm getting older, and I would love to try these out, as Yves Rocher is a great brand. I haven't really tried too many anti-aging products, but I'm starting to get to the age where I should probably start. I am one of those rare men that use anti aging products, I've started using them since I turned 40 and the products are working wonderfully. i'm at the age where I see wrinkles as craters others see them as laugh lines..
Yves Rocher has great products! As I have hit my 40's I can no longer take my skin for granted as fine lines and wrinkles keep showing up. I'm willing to try and creams or skin products that may help my skin look younger longer. I would hope they would work at least somewhat. I don't currently use any anti aging products, but I'm starting to notice fine lines and wrinkles, so I need to start. I've tried a few anti-aging products over the past couple years and I haven't noticed a difference in my fine lines or crows feet, using any of them. I would love to try these products out and see if they work for me! I've been experimenting with anti-aging products for the past few months. My skin is sensitive so I have yet to find something that can be my "go to" product. I haven't yet tried Yves Rocher... maybe this line will be the one! I would like to try them (haven't yet) to slow down the aging of my skin.